Amara War Cemetery contains 4,621 burials of the First World War, more than 3,000 of which were brought into the cemetery after the Armistice. 925 of the graves are unidentified. In 1933, all of the headstones were removed from this cemetery when it was discovered that salts in the soil were causing them to deteriorate. Instead a screen wall was erected with the names of those buried in the cemetery engraved upon it. 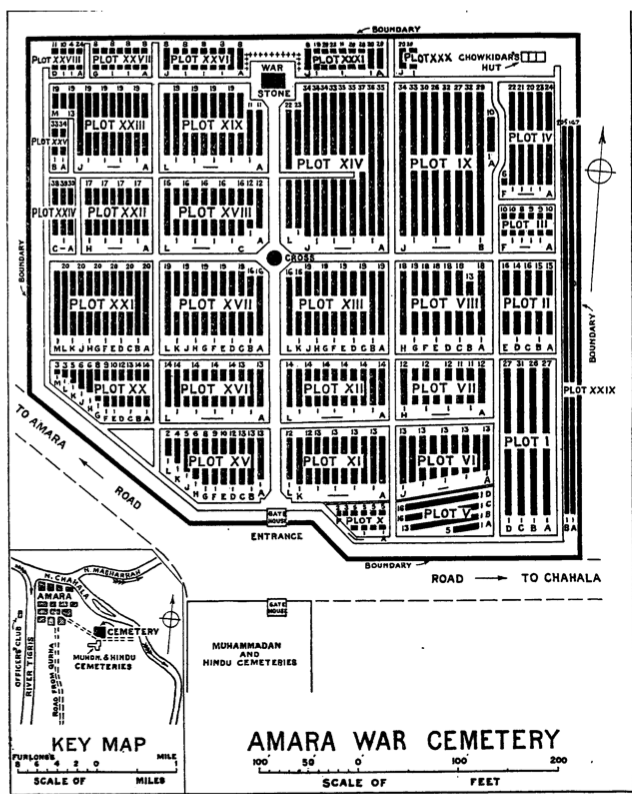 Plot XXV is a Collective Grave, the individual burial places within this are not known. There are also seven non-war graves in the cemetery. 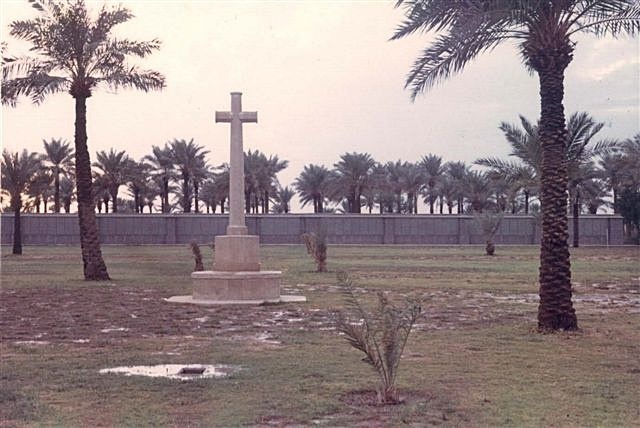 The picture (used with the permission of the Commonwealth War Graves Commission) is of Amara War Cemetery. The cemetery was destroyed during the Iraq war and will be rebuilt by the commission once the current climate of political instability improves. Lieutenant-Commander Edgar Christopher Cookson, V. C.
H. M. S. Clio, Royal Navy, died 28th September 1915, aged 31. Plot IV. A. 15. Son of Capt. W. E. Cookson, R.N. Citation: An extract from "The London Gazette," dated 21st May, 1915, records the following:- "On the 28th September, 1915, the river gunboat "Comet" had been ordered with other gunboats to examine and, if possible, destroy an obstruction placed across the river by the Turks. When the gunboats were approaching the obstruction a very heavy rifle and machine gun fire was opened on them from both banks. An attempt to sink the centre dhow of the obstruction by gunfire having failed, Lieutenant-Commander Cookson ordered the "Comet" to be placed alongside, and himself jumped on to the dhow with an axe and tried to cut the wire hawsers connecting it with the two other craft forming the obstruction. He was immediately shot in several places and died within a very few minutes." Lieutenant Colonel Edward Elers Delavel Henderson, V. C.
Commanding 9th Bn. Royal Warwickshire Regiment, died 25th January 1917, aged 38. Plot XXIV. B. 31. Husband of Mrs. M. Henderson, of "Tall Trees," Park Rd., Camberley, Surrey. 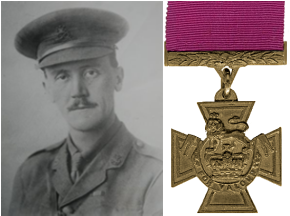 Citation: An extract from "The London Gazette," dated 8th June, 1917, records the following:- "For most conspicuous bravery, leadership and personal example when in command of his battalion. Lt. Col. Henderson brought his battalion up to our two front-line trenches, which were under intense fire, and his battalion had suffered heavy casualties when the enemy made a heavy counter-attack, and succeeded in penetrating our line in several places, the situation becoming critical. Although shot through the arm, Lt. Col. Henderson jumped on to the parapet and advanced alone some distance in front of his battalion, cheering them on under the most intense fire over 500 yards of open ground. Again wounded, he nevertheless continued to lead his men on in the most gallant manner, finally capturing the position by a bayonet charge. He was again twice wounded, and died when he was eventually brought in." 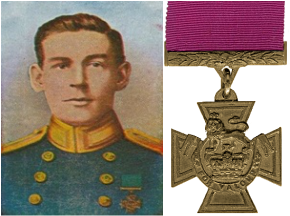 920 Corporal Sidney William Ware V. C.
1st Bn. Seaforth Highlanders, died 16th April 1916, aged 24. Plot VI. H. 1. Son of William and Maud Ware, of 1, Pine Cottage, Sutton Veny, Warminster, Wilts. Born at Winterbourne, Whitechurch, Dorset. Citation: An extract from "The London Gazette," No. 29765, dated 26th Sept., 1916, records the following:-"For most conspicuous bravery. An order was given to withdraw to the cover of a communication trench. 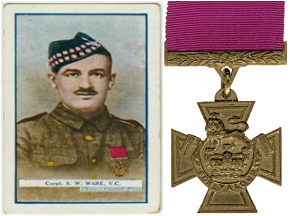 Corporal Ware, whose cool gallantry had been very marked during the advance, was one of the few men remaining unwounded. He picked up a wounded man and carried him some 200 yards to cover, and then returned for others, moving to and fro under very heavy fire for more than two hours until he had brought in all the wounded and was completely exhausted."